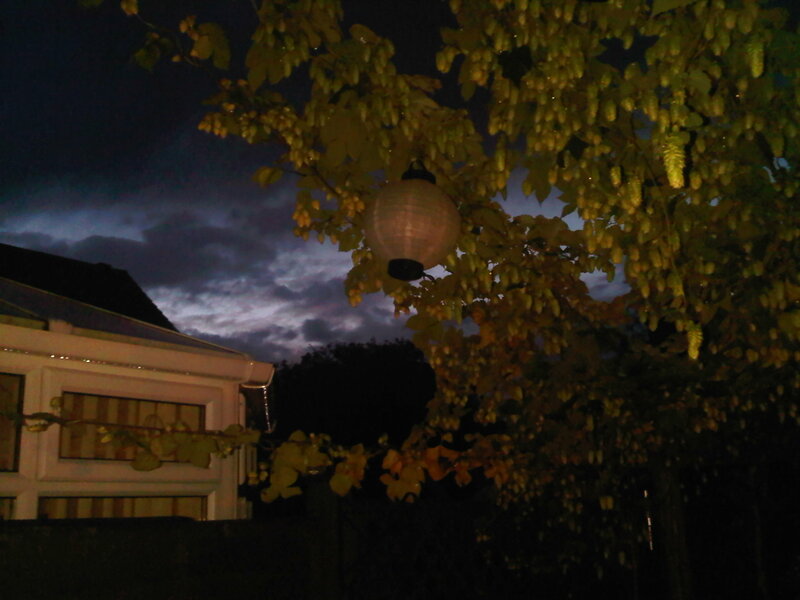 Another year has passed since I planted my little hop cuttings and now my hop plants are well and truly established. I always thought that the pots were a little small, so I expanded their soil volume by cutting the bottoms off of some new pots and placing them on top of the old ones before filling them up with soil to create 2-high pots, detailed here. While they grew well the first year and I actually managed to get a few hundred grams of dried hop cones of various varieties, some definitely tasted better than others. The Cascade was tasty and the Saaz was terrific (I even took a first place at the 2011 National Homebrew Competition with a German Pilsner made with them, more to come), but the Mt Hood tasted a bit of artificial sweeteners (weird, I know). Some didn’t really flower enough to even warrant havesting the first year (Hallertau and Sterling), but this year they all grew brilliantly. The quality of the hops this year really was noticeably better than last year. The climate here in Essex really does seem to be perfect for them, although the wet summer this year did cause me some issues. This year they were much bigger and more aromatic than last year, the whole house was filled with the smell of them while they were drying which was kinda nice. I’m really looking forward to brewing with these, hops tend to exhibit terroir much like wine grapes do so they never taste quite like their commercial counterparts, instead they show the character of the area and climate in which they are grown. 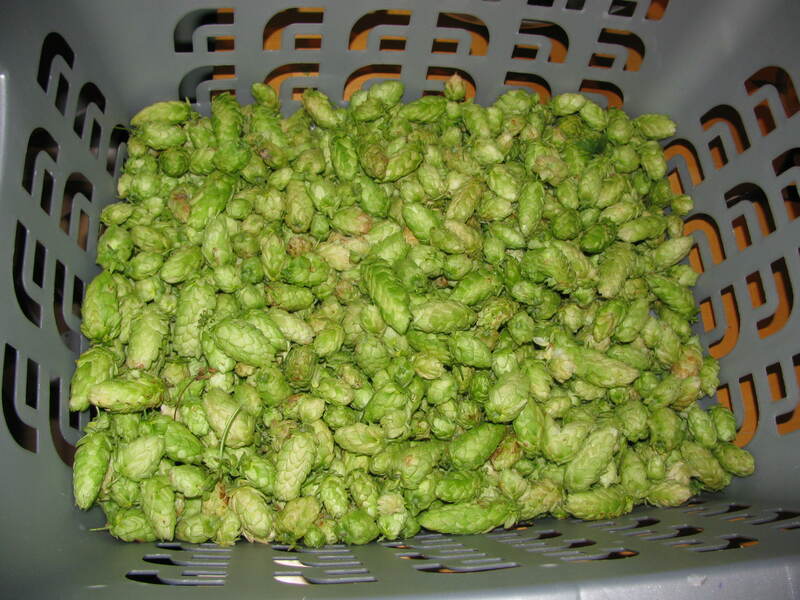 I had so many hop cones this year that it was actually quite a job to harvest them all. I ended up doing the whole lot over the course of two weeks, harvesting the plants one by one and drying on my kitchen table on newspaper for a few days with the assistance of a fan to help speed things along and reduce the chance of mould. 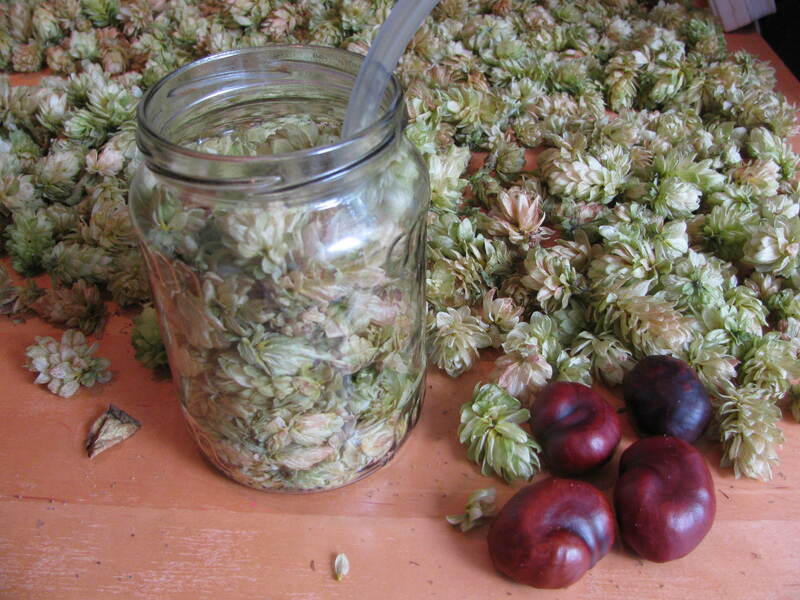 Once dried, I weighed the beautifully aromatic cones and stored them compressed in glass jars. 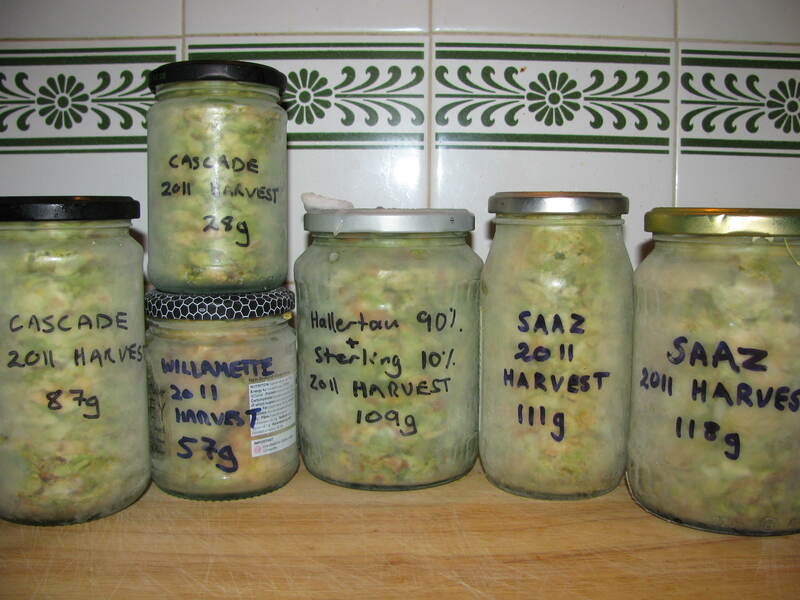 Glass jars are pretty good oxygen-barriers and are great for storing hops long-term. I lightly blew some CO2 from my kegging system into the bottom of the jars while packing the hops in tightly by hand in order to purge as much oxygen from the jars as possible. Stored this way in the bottom of the freezer, hops should stay green and retain their fresh aroma for at least a year or two. Aargh – not fair! 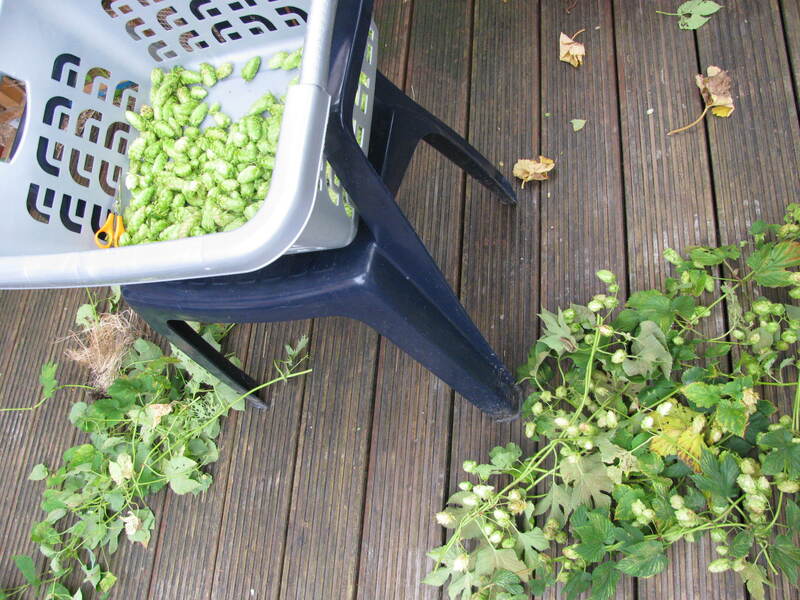 I want to grow some hops in Scotland too but I’m not too hopeful of making a success out of it. But you have inspired me – I’m going to give it a go! Wow, can’t believe I missed your comment, Bertie. Many apologies!